It seems like nothing stays secret in the world of cars anymore. 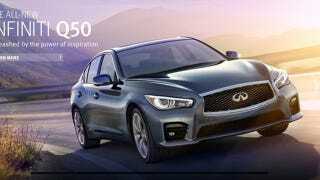 Case in point: even the Infiniti Q50 has leaked before its planned reveal at the Detroit Auto Show in a matter of days. Of course it's very easy to keep track of where the Q50 slots into Infinti's lineup because all their cars are now named Q and, oh wait, no, it's impossible to remember what this thing is supposed to be. Well, we can tell you that it's going to replace the aging and somewhat blobby-looking G37. The leaked images were pulled from G37 forum myg37.com by Car Style Blog. The shot comes from Infiniti Canada's website, which showed the car briefly. We think it looks pretty mean in this press picture, but do you think it has the style to match up against the ATS, the 3 series, or the new Lexus IS? Let us know in Kinja below.